For me, photography is a hobby that I love. But, sometimes snapping photos of unique, pretty, artistic scenery just gets old. Occasionally I want to be in the picture! And, I don’t want to have that awkward arm in the frame from taking pics of myself—isn’t that kind of up there with photographing yourself making a duck face in a mirror on the “d-bag” scale? Product received for review. As a parent, I have googols of photos of my children and I think I may be in two of them. Especially since I am a single parent, it is very rare when an opportunity presents itself for a family photo-op. This handy little photography accessory can be used with still shots (just use your timer) and video. With the universal Super Mount, any smartphone will fit. It is lightweight and small enough to fit in your backpack or purse. They even have another version that doubles as a walking stick for hiking, skiing, snow-shoeing, and so on! I highly recommend checking out some of these videos. The grey whale encounter is just awesome! I think the best part about this product is that it allows you to actually be in the moment. Not just that you are on the screen, but you aren’t stuck behind a lens missing what is right in front of you. I can’t tell you how many times I’ve gone to an event for my children and missed it because I was so focused on getting photos and video. 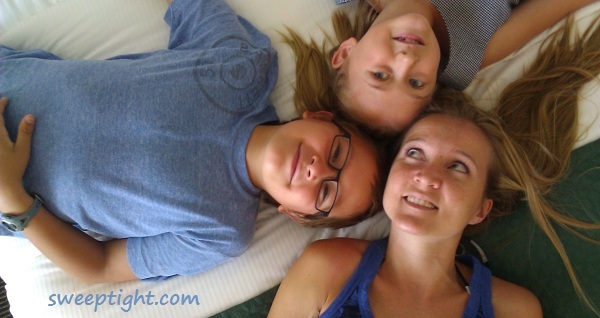 Here is one of my favorite shots of the kids and I at a hotel sprawled out on the bed. This was taken using the iPole Mini, Super Mount and my smartphone. I would love to win, I love taking pictures and this ipole is lightweight. I could take better self-portraits with this attachment. I’d love to win this for taking family photos when we are traveling! I would like to win because this would allow us to take some shots of our daughter that we wouldn’t be able to do otherwise. I would love to be included on my videos as I’m never present because I’m behind the camera. the only time I get in the pictures is if I give my camera to my 8 year old nephew. He takes great photo’s! But he’s not always around, so this would be handy to use! I would like to win so I would get to be in more of my family pictures. So I can finally be in the pictures with my kids! Because it would be neat to have the beautiful backgrounds in the picture without falling off the cliff. I’d like to win to give this to my daughter who’s interested in photography. I’d love to win so I could take better pictures with my iphone!! I’d love to win because I am always taking pictures but never get to be in them. This would be great! I would love to win this because I love to take pictures every day and I especially love to take hummingbird photo’s and other wildlife pictures. This would be awesome to help me get the shot without my “subject” getting scared off! I like the height range on this- this would be great for me- I take lots of photos with my iphone. i am right there with you, I have hardly any pictures of me with my kids, plenty of them. and when I do try to take them myself, the angle ends up being awkward. I hate the arm in the photo pics!!!! You can’t get a straight pic. I’d like to won this so I can be group pictures that i take. Thanks. I would like to win because my husband video tapes our son’s basketball games and it would assist him in keeping the camera steady. Sounds like a great gadget to try out! would love to be able to take pictures of my husband an i together for a change! I would like to win because I am always the one behind the camera! This would allow me to be with my family in the places we go. It is always funny to show people pictures and they ask “where were you?”. I have to tell them that I was taking the shot. i just got an awesome camera but this would help me take super awesome pictures while letting me still be in them. I would like to win because this would be so handy to use for crowded events. 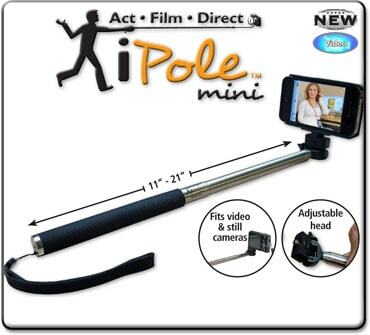 Just use the pole and get better video or pictures. awesome idea! I’d love to win this! It’s perfect to use when my wife and I want to get that special shot of ourselves while we are out and about and we don’t have to bother anyone to help out! i would like to win so i can have better shots of my whole family all together. This is ingenious! I also love the RhinoMount and the RhinoMount Mini! I am a shaky picture taker and this would sure help . My hubby takes lots of pictures and he would get some really neat ones with this! I like the iPole and iPole Mini. I would love to have this to use with my small Canon camera or GoPro to get underwater shots of sharks from the boat! I run a shark-diving project for cancer survivors, so this would be perfect for capturing another angle of experiences and video from before/after our swims! what an awesome idea! I love taking pics with my mom and daughter and the dreaded arm is always there :). This woiuld be really nice to have! I’d love to win because I go on road trips for places to photograph and I am a naturally shaky person. This would be perfect! I dont have a camera! SO I NEED THIS. I’d love to win because this would be helpful while taking pictures. I’m just starting a blog and can’t have someone else taking my pics all the time. This will help me! I would like to win because this looks very useful!